Spacious bright apartment with 2 bedroom and free parking in the heart of Ghent. In a small graffiti alley you will find a surprise. A renovated apartment for 4 people in an old building in 60s style. Thanks to the large windows you have a stunning view on the Lys and a small marina. The vista on the rippling water creates a constant relaxed 'zen' atmosphere, despite you are in the heart of the city center. i feel a little bit sad by the moment because there are big works in the neighbourhood. Sometimes you can be disturbed by noise of the machines, but lucky they stop at 4PM and they don't work in the weekends. The apartment is furnished with timeless design. The kitchen has a cooking island with induction, microwave oven, dishwasher, fridge etc.. Bedroom 1 has a double bed 1m60 to 2 m. Bedroom 2 has a double bed 1m80 to 2 m. These bedroom is furnished as a little studio with a seating. Just good for your adolescents, On that way, they have a place for themselves. Less suitable for small childeren as the balustrade around the windows is not very high. The spacious bathroom has a shower and washbasin. There is a storage room with a washing machine. There is a free parking provided in the underground garage of the building. 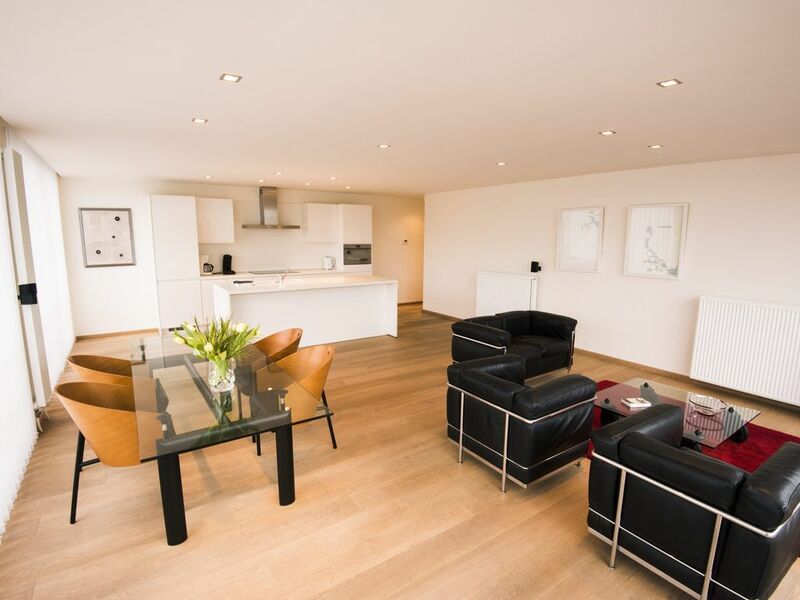 Very nice and large apartment in the center of Ghent. Exactly what we needed for a family of four. Clean, large apartment near to all that is happening in Ghent. Owner very helpful and accommodating. Apartment had everything we needed for a family of four. Nearby summer construction during the day created some noise but owner was clear in listing and we were not surprised. We would stay here again! Recommend to anyone for a stay in Ghent. Everything you could possible need and only 10 min walk into city of Ghent. Immaculately clean and very spacious. Building work next door but that didn't spoil the experience at all. Nicky the host has excellent communication. Hope to visit again in the future. Many thanks for a wonderful (and very hot weather) stay. Nicky (owner) was AWESOME. She met me at the train station and we traveled together to the apartment. The photos are exactly as the apartment. Centrally located. Easy walk to the Ghent City Center. Tram runs in front of the building. Plenty of restaurants and grocery shopping extremely close. Wonderful view of the canal and small harbor. Nicky had maps and tourist information for Brugge, Antwerp, and Brussels. All three cities easily assessable by train. Will definitely utilize Nicky's apartment on my next visit to Ghent. Great Location - Great flat! We stayed in this apartment for the Light Festival in Ghent in 2018. The location was absolutely brilliant and so close to the city centre. We walked absolutely everywhere we could. The apartment was spacious, light and clean. We couldn't have asked for more. Although we never met Nicky, the owner; the communication with her was fast and engaging. Overall, we highly recommend this place and thoroughly enjoyed our stay in Ghent. We had a lovely stay at Christmas in this beautiful, well equipped and tastefully decorated apartment. The apartment is so comfortable, including the beds and the location was perfect as it’s so close to bars, restaurants and shops. Nicky was so helpful and made us feel so welcome. I would definitely stay here again when we return to Ghent! Leading up to our arrival Nicky was very good keeping in touch and detailed on how to find the apartment. Nicky is a great host and shared loads of local information, great restaurants serving lovely traditional Belgium food as well as the local must see sights! A really lovely apartment , spotlessly clean and really well appointed. While there was building work taking place, it certainly didn’t bother either my wife or me.